Chance led the procession and cast his vote after his free Chicago concert. After kicking off with a free concert in Chicago's Grant Park Monday afternoon, Chance the Rapper's #ParadeToThePolls event lived up to its name, leading a massive crowd, reportedly in the thousands, out to early voting locations nearby. 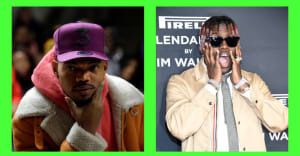 The event, organized by Chance's nonprofit, SocialWorks, was well-documented by local press outlets, including ABC 7 News, who noted that Chance's effort to get out the vote came as part of a massive, record-breaking surge in early voting in Cook County. Additionally, participants took to social media to document their experience, posting photos and video clips using the hashtags #ParadeToThePolls and #StayWokeAndVote. Some highlights from the scene below.